This is the top to a, you know, what we use on stage but it's very, very special because, if you can see ... Yeh ... the numbers all go to eleven. Look, right across the board, eleven, eleven, eleven and ... Oh, I see. And most amps go up to ten? Exactly. Does that mean it's louder? Is it any louder? Well, it's one louder, isn't it? It's not ten. You see, most blokes, you know, will be playing at ten. You're on ten here, all the way up, all the way up, all the way up, you're on ten on your guitar. Where can you go from there? Where? I don't know. Nowhere. Exactly. What we do is, if we need that extra push over the cliff, you know what we do? Put it up to eleven. Eleven. Exactly. One louder. 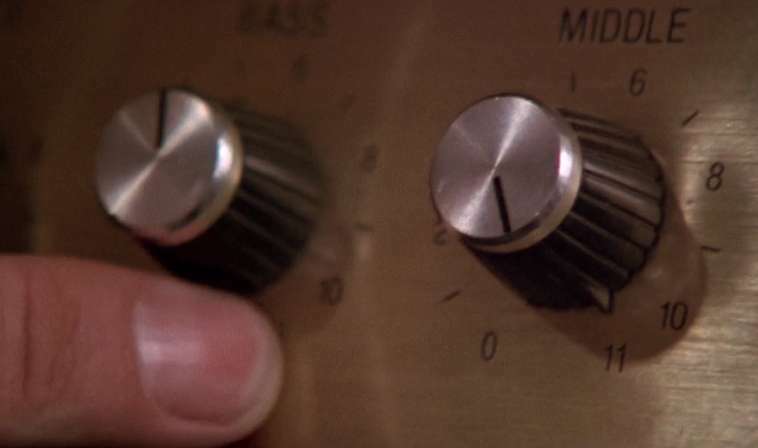 Why don't you just make ten louder and make ten be the top number and make that a little louder? ... These go to eleven.